Galatians 3:25-29: Now that faith has come, we are no longer under the supervision of the law. You are all sons of God through faith in Christ Jesus, for all of you who were baptized into Christ have clothed yourselves with Christ. There is neither Jew nor Greek, slave nor free, male nor female, for you are all one in Christ Jesus. If you belong to Christ, then you are Abraham's seed, and heirs according to the promise. When Paul speaks of no longer being under the supervision of the law, he is not implying moral law is no longer in operation. Note what Paul says in verse 19 of this chapter. Galatians 3:19: What, then, was the purpose of the law? It was added because of transgressions until the Seed to whom the promise referred had come. Paul is referring to various Mosaic regulations being added to the existing moral law because of transgression of existing moral law. Israelites, as was true of all mankind, were sinning by failing to practice the law of love. God separated them from the rest of mankind and added to the moral law a system of regulations that if kept would constantly focus them on righteous behavior. Paul makes it clear that such additions were only until the promised seed had come. What were these additions? These additions were the religious regulations designed to keep Israel in a relationship with God and separate from other nations. Romans 3:20-24: Therefore by the deeds of the law there shall no flesh be justified in his sight: for by the law is the knowledge of sin. Therefore no one will be declared righteous in his sight by observing the law; rather, through the law we become conscious of sin. But now a righteousness from God, apart from law, has been made known, to which the Law and the Prophets testify. This righteousness from God comes through faith in Jesus Christ to all who believe. There is no difference, for all have sinned and fall short of the glory of God, and are justified freely by his grace through the redemption that came by Christ Jesus. In this passage, the word “the” does not precede the word law in the Greek except where Paul speaks of "the Law and the Prophets" where he apparently is referencing the Mosaic Law. Paul appears to be simply saying that by deeds of law no man is justified. This includes all law including moral law. That moral law is included is demonstrated by what Paul wrote in Romans 7. Here Paul shows how moral law identifies sin by referencing some of the moral law contained in the Ten Commandments. Romans 7:7: What shall we say, then? Is the law sin? Certainly not! Indeed I would not have known what sin was except through the law. For I would not have known what coveting really was if the law had not said, "Do not covet." Paul shows in this chapter that behavior contrary to the law (including moral law) identifies what sin is. He shows, through the use of a metaphor, that through Christ we have died to the law and are released from its authority over us. Romans 7:1-2-4: Do you not know, brothers--for I am speaking to men who know the law--that the law has authority over a man only as long as he lives? For example, by law a married woman is bound to her husband as long as he is alive, but if her husband dies, she is released from the law of marriage. So then, if she marries another man while her husband is still alive, she is called an adulteress. But if her husband dies, she is released from that law and is not an adulteress, even though she marries another man. So, my brothers, you also died to the law through the body of Christ, that you might belong to another, to him who was raised from the dead, in order that we might bear fruit to God. What Paul appears to be saying is that just like the marriage bond is broken when one of the spouses dies, so also was being bound to the Mosaic Law broken by the death of Christ. This enabled Israel to now become involved in a relationship with the raisin Christ based not on being justified by law keeping but by the sacrifice of Christ. Why then does Paul say to these same Roman Christians “For not the hearers of the law are just before God, but the doers of the law shall be justified” (Romans 2:13). Is Paul talking out of two sides of his month? In Romans 2:21 and 22, you find the law Paul is referring to is the moral code. He specifically refers to stealing, adultery and sacrilege, which is disrespect. Paul shows moral behavior operational for Gentiles as part of their conscience whereas the Jews had moral behavior spelled out in the written code of the Mosaic regulations. Moral behavior is thus seen as required and expected on the part of all mankind in order to be pleasing to God. So what is Paul saying in Romans 2:13? He certainly can't be saying that man is justified by keeping law as he has already said that is not the case in Romans 3:20. What he appears to be saying is not that moral behavior is what justifies man before God but that those who behave in a moral way will be justified. They will have their sins forgiven and be reconciled to God. God expects us to live by the law of love. There is an expectation of repentance which is the turning away from behaviors contrary to the law of love to behaviors in harmony with the law of love. God requires us to love each other and fulfill the moral law. By loving each other we also love God because we are responsive to His will. We love God by respecting His sovereignty. Man has always had difficulty keeping moral law and respecting God’s sovereignty. Man was so remiss in moral behavior that God decided to destroy everyone except Noah and his family. The history of the world is a history of broken moral law. God choose Israel to be a light to the rest of the human race. He made a covenant with them that included moral law which had been extant since creation. He included a complete package of civil and religious regulations that if kept would have made Israel the darlings of the world. Israel failed miserably and God terminated the covenant. Through Christ, God established a New Covenant that rescues man from the consequences of sin. This covenant was facilitated through the death and resurrection of Jesus. Acceptance of Christ’s sacrifice reconciles one to God and begins the process of having God’s law established in ones heart enabling love to be the overriding dynamic in all relationships. John 13:34: "A new command I give you: Love one another. As I have loved you, so you must love one another. By this all men will know that you are my disciples, if you love one another." James 2:8: If you really keep the royal law found in Scripture, "Love your neighbor as yourself," you are doing right. James 1:22-25: Do not merely listen to the word, and so deceive yourselves. Do what it says. Anyone who listens to the word but does not do what it says is like a man, who looks at his face in a mirror and, after looking at himself, goes away and immediately forgets what he looks like. But the man who looks intently into the perfect law that gives freedom, and continues to do this, not forgetting what he has heard, but doing it--he will be blessed in what he does. Apostle Paul also writes about freedom. Paul says that in Christ, we are free from a yoke of slavery which he defines as being circumcised and therefore under obligation to keep the whole law. Galatians 5:1-3: It is for freedom that Christ has set us free. Stand firm, then, and do not let yourselves be burdened again by a yoke of slavery. Mark my words! I, Paul, tell you that if you let yourselves be circumcised, Christ will be of no value to you at all. Again I declare to every man who lets himself be circumcised that he is obligated to obey the whole law. The context clearly shows it is the Law of Moses that is at issue here. Paul was dealing with the problem of Jews trying to convince Gentile converts to Christ that they must be circumcised and keep the Law of Moses in order to appear righteous before God. Paul explains it is through faith in Christ that righteousness is obtained and not by observing the Mosaic Law. Galatians 5:4-6: You who are trying to be justified by law have been alienated from Christ; you have fallen away from grace. But by faith we eagerly await through the Spirit the righteousness for which we hope. For in Christ Jesus neither circumcision nor uncircumcision has any value. The only thing that counts is faith expressing itself through love. Paul’s letter to the Galatians clearly shows how exasperated he was with these Gentile converts for yielding to the pressure of the Judaizers in their attempts to have the Gentile Christians embrace the Mosaic regulations. In chapter 4:3-5, Paul writes, “we were in slavery under the basic principles of the world. But when the time had fully come, God sent his Son, born of a woman, born under law, to redeem those under law, that we might receive the full rights of sons.” Here we see Paul associating what he calls basic principles of the world with being redeemed from being under law. It wold appear the law of Moses is in view here. Paul goes on to identify what these basic principles are. Galatians 4:9-11: But now that you know God--or rather are known by God--how is it that you are turning back to those weak and miserable principles? Do you wish to be enslaved by them all over again? You are observing special days and months and seasons and years! I fear for you, that somehow I have wasted my efforts on you. What law is Paul addressing here? In Galatians 4:9-11, Paul asks them why they are turning back to observing days, months and seasons which he associates with weak and miserable principles. He asks them why they wish to be enslaved by them all over again. As we saw in Galatians 5:1-3, Paul exhorts them not to turn back to a of yoke slavery which he associates with circumcision and keeping the whole law. Again it is apparent the Law of Moses is in view here. Paul is strongly admonishing these Galatians not to turn back to what had been eliminated by the Christ event. The entire context of Paul’s letter to the Galatian Christians pertains to his concerns about these Gentile converts being pressured into keeping Mosaic regulations that no longer were necessary. Some have argued that Paul could not have been talking about Mosaic regulations when he speaks of returning to basic principles of the world because these Gentile Galatians would not have been keeping Mosaic regulations in the first place. It is asked how they could return to something they never did. Those who make this argument believe Paul is talking about returning to various pagan practices when speaking of basic principles of the world. However, it must be understood that these Gentiles Christians were being pressured by the Jews to adhere to the Mosaic regulations. Paul is simply asking them why they would want to return to doing something that has been done away. He is using "return" in a rhetorical sense. That Paul is speaking about the Law of Moses and not pagan practices is confirmed by verses 21-31. Galatians 4:21-31: Tell me, you who want to be under the law, are you not aware of what the law says? For it is written that Abraham had two sons, one by the slave woman and the other by the free woman. His son by the slave woman was born in the ordinary way; but his son by the free woman was born as the result of a promise. These things may be taken figuratively, for the women represent two covenants. One covenant is from Mount Sinai and bears children who are to be slaves: This is Hagar. Now Hagar stands for Mount Sinai in Arabia and corresponds to the present city of Jerusalem, because she is in slavery with her children. But the Jerusalem that is above is free, and she is our mother. For it is written: "Be glad, O barren woman, who bears no children; break forth and cry aloud, you who have no labor pains; because more are the children of the desolate woman than of her who has a husband." Now you, brothers, like Isaac, are children of promise. At that time the son born in the ordinary way persecuted the son born by the power of the Spirit. It is the same now. But what does the Scripture say? "Get rid of the slave woman and her son, for the slave woman's son will never share in the inheritance with the free woman's son." Therefore, brothers, we are not children of the slave woman, but of the free woman. Paul shows how being under the Old Covenant meant being under slavery and how the New Covenant brings release from that slavery. The entire context of Galatians 4 and 5 is the Old Covenant versus the New Covenant and being in slavery under the requirements of the Mosaic Law and being freed from such slavery because of the Christ event. Paul tells the Galatians it is only through faith in Christ and not by works of the Mosaic Law that righteousness is attained. Paul is telling the Galatians that keeping the Mosaic Law will not justify them. Only faith in Christ can justify us before God. Paul makes it clear, however, that faith in Christ equates with having love for one another. This love is expressed by how we behave toward one another. Faith in Christ is defined as the expression of love. As already seen, love is defined as behaving according to the moral law. In Galatians 5:11, Paul writes; “Brothers, if I am still preaching circumcision, why am I still being persecuted? In that case the offense of the cross has been abolished.” Paul was being persecuted because he was preaching that circumcision was no longer necessary. In preaching that circumcision was no longer necessary, Paul was saying that adherence to the Mosaic Law was no longer necessary. The Jews, including many Jewish converts to Christianity and probably Gentile proselytes to Judaism, continued to believe adherence to the Mosaic regulations was necessary to facilitate a righteous standing before God. Paul was being persecuted because by preaching against circumcision he was preaching against the need to observe the Mosaic regulations. And yet as strong as Paul is in his teaching that keeping the Old Covenant law is not the pathway to a righteous standing before God, he is equally as strong in teaching that we must keep the moral law. Galatians 5:13-14: You, my brothers, were called to be free. But do not use your freedom to indulge the sinful nature; rather, serve one another in love. The entire law is summed up in a single command: "Love your neighbor as yourself. What is Paul saying we are free from? The context of Galatians 5 is about freedom from attempting to establish our own righteousness by observing the Old Covenant regulations. The moral law was part of those regulations. Yet the moral law is clearly seen as continuing to be in force, not as a vehicle for being justified but as an expression of our faith in Christ. The Old Covenant of works as the pathway to a righteous standing before God was being abolished and replaced by the New Covenant where righteousness is established by placing faith in Christ and having the law written in our hearts. What law is written in our hearts? In Romans 8 Paul defines the law written in our hearts as the law of the Spirit. Romans 8:1-4: Therefore, there is now no condemnation for those who are in Christ Jesus, because through Christ Jesus the law of the Spirit of life set me free from the law of sin and death. For what the law was powerless to do in that it was weakened by the sinful nature, God did by sending his own Son in the likeness of sinful man to be a sin offering. And so he condemned sin in sinful man, in order that the righteous requirements of the law might be fully met in us, who do not live according to the sinful nature but according to the Spirit. Galatians 5:19-21: The acts of the sinful nature are obvious: sexual immorality, impurity and debauchery; idolatry and witchcraft; hatred, discord, jealousy, fits of rage, selfish ambition, dissensions, factions and envy; drunkenness, orgies, and the like. I warn you, as I did before, that those who live like this will not inherit the kingdom of God. Paul taught that if we live by the Spirit which is the same as living by the law of love, we will not commit the acts of the sinful nature. In Galatians 5:18 Paul writes; "if you are led by the Spirit, you are not under law." How can that be? If we are expected to live by the law of love, are we not under that law? What is Paul talking about? If we carefully study the writings of Paul we find that throughout his ministry he is dealing with one central issue. By what mechanism do we become righteous before God? 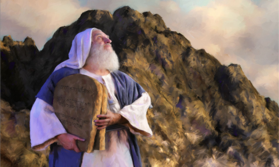 Under the Old Covenant Israel sought to establish righteousness before God by behaving according to the requirements of the law that made up the Old Covenant. That law included the moral code established since creation and a great deal of additional added law, both civil and religious. This entire body of law was called the Law of Moses. It was by keeping this law that the Israelites sought to maintain a righteous standing before God. This approach failed miserably because of mans sinful nature. God facilitated a change to the system through the Christ event. The sacrifice of Christ pays the penalty of our sin and his righteousness is applied to us enabling reconciliation with God. Paul can rightly say that if we are led by the Spirit we are not under law because law has no claim over us. Law only has a claim if we violate it. By being in Christ, however, violation of law is covered by His sacrifice as long as we remain committed to Christ. Being committed to Christ means being committed to the law of love. What law is that? It clearly is not the separatist religious law contained in the Old Covenant. This is made plain by the conclusions reached at the Jerusalem conference recorded in Acts 15 and the plain instruction given to the Colossian Christians regarding Sabbaths, festivals, new moons, etc. This is made plain in Paul teaching the Ephesians that the laws of separation have been abolished. Therefore it should be apparent it is not these laws that are written in our hearts. It should be clear it is the moral law, in existence since creation, that is in view when Paul writes to the Galatians that the "entire law is summed up in a single command: "Love your neighbor as yourself." This is the same royal law spoken of by James as already discussed. Paul has the moral law in view when he instructs the Galatian Christians as to what kind of behavior they are to avoid. We see Christ recite some of the moral law when asked what must be done to obtain eternal life. It is instructive that Jesus says nothing about Sabbath or Holy Day observance, dietary restrictions or any other such regulations of the Mosaic Law. Jesus only recites portions of the moral law. In answering the man in the manner that he did, was Jesus saying that keeping the moral law would earn one eternal life? No He wasn’t. Jesus was saying the same thing Paul said to the Romans; “For not the hearers of the law are just before God, but the doers of the law shall be justified” (Romans 2:13). Jesus is not teaching that keeping moral law grants one eternal life but that those who behave in a moral way will be granted eternal. They will have their sins forgiven and be reconciled to God. As already discussed, there is the expectation of repentance which is the turning away from behaviors contrary to the law of love and turning to behaviors that are in harmony with the law of love. Repentance is seen throughout Scripture as a prerequisite for establishing a relationship with God. Apostle James addresses this issue as well. James 2:14-17: What good is it, my brothers, if a man claims to have faith but has no deeds? Can such faith save him? Suppose a brother or sister is without clothes and daily food. If one of you says to him, "Go, I wish you well; keep warm and well fed," but does nothing about his physical needs, what good is it? In the same way, faith by itself, if it is not accompanied by action, is dead. James is providing a practical example of faith being expressed through love and that it is only this kind of faith that has efficacy. Remember what Paul said to the Galatians: The only thing that counts is faith expressing itself through love.” This is the key to our whole discussion. Faith in Christ is defined by behaving according to the Law of Love and the Law of Love is defined by the moral code. By placing faith in Christ for salvation we commit to behaving according to the royal law of love. While it is the sacrifice of Christ that saves us, that faith must be expressed through practicing the law of love. We began our discussion by asking the question “WHAT IS AND WHAT AIN’T.” In other words, WHAT LAW IS GONE? WHAT LAW REMAINS? We also asked what Paul meant by saying we are not under law but under grace while at the same time saying we are not to sin which Scripture shows is the breaking of law? Let us revisit this passage and go a little deeper into it. Romans 6:14-18: For sin shall not be your master, because you are not under law, but under grace. What then? Shall we sin because we are not under law but under grace? By no means! Don't you know that when you offer yourselves to someone to obey him as slaves, you are slaves to the one whom you obey--whether you are slaves to sin, which leads to death, or to obedience, which leads to righteousness? But thanks be to God that, though you used to be slaves to sin, you wholeheartedly obeyed the form of teaching to which you were entrusted. You have been set free from sin and have become slaves to righteousness. Being under law places one under its control. As humans, we all break law. Law demands a penalty for disobedience to its requirements. It is powerless to provide release from such penalty. We become a slave to law in so much that we can’t get released from its penalty. Law holds us hostage. Christ has provided release from the control of law by meeting its demands of penalty. We are therefore no longer slaves to law because it no longer has a claim over us. The claim has been met by Christ. In Christ we are under grace which provides for continual protection from the penalty of eternal death for breaking law. This continuous protection proceeds from God in response to what Christ did. This continuous protection presupposes our having faith in Christ expressed through love. We become slaves to the law of love which is the same as saying we become slaves to righteousness. This righteousness is not defined by the practice of religious regulations sometimes referred to as legalism, but by expressing the fundamental moral laws of human conduct extant since creation. Our slavery to the law of love doesn’t earn us life. Christ did that by what He accomplished on the cross. Our slavery to righteousness is our expression of faith in Christ. It tells Christ we love him, want to obey Him and appreciate what He has done for us. It tells Christ we have made the choice to have the law of love written in our hearts to have it become part of our very conscience. Some feel that any required obedience to law is legalism and therefore runs contrary to grace as the basis for establishing a relationship with God. Let’s define what legalism is and what it is not. Requiring obedience to law as a means of establishing a righteous standing before God is legalism. We can’t earn a righteous standing before God based on our obedience. Only the sacrifice of Christ can establish us as righteous before God. Christ had a righteous standing before God by living a sinless life and it is His righteousness that enables us to have a relationship with God. Is it legalistic to be required to obey moral law? It can be if we are obeying law to maintain a righteous standing before God. God doesn’t require us to keep the moral law or any other law as a means of establishing or maintaining righteousness with him. That was tried with Israel and it didn’t work. It must be understood, however, that God does require and expect us to honor the righteous status bestowed upon us through what Christ did. We do this by obeying the law of love. This is how we express faith in God. Keeping the law of love is not legalism. We don’t keep law to earn a righteous standing before God. We keep law as a response to what God has done for us. It is a demonstration and expression of faith in God. This expression of faith, however, does not include keeping laws that have been done away by God. The Old Covenant separatist regulations have been done away. Our expression of faith in God does not include the keeping of these regulations. The same is true of regulations and prohibitions that have been added by men throughout the centuries which become looked upon as being required to please God when in effect they are not so required. We find examples of such added regulations and prohibitions in fundamentalist Christian fellowships and even in many mainstream Christian churches. All such requirements constitute legalism because they are not required by God and yet are believed to be required by God in order to be pleasing to Him. As a youth, I attended a fundamentalist Christian fellowship that determined that such things as playing cards, going to a movie, dancing, playing pool or drinking alcoholic beverages was sin. This is an example of religious legalism. This is an example of adding regulations that are not required by God. It was believed gambling was sinful and that since playing cards is associated with gambling, it must also be sinful. As it turns out, neither is sinful. Going to the movies was sinful because it was felt one was giving acceptance to the sinful behavior being portrayed on the sliver screen. Dancing was a no, no because it could lead to sinful sexual activity. Playing pool was associated with pool halls where sinners hung out. Drinking alcoholic beverages was sin because it could lead to drunkenness. These are all examples of regulations added by man based on faulty reasoning as to what sin is. Within legalism, the thing is often though to be sin rather than the misuse of the thing. Sin is not the thing but the misuse of the thing. If dancing led to committing fornication or adultery, it would be the fornication or adultery that is sin, not the dancing. If drinking beer leads to drunkenness, it is the drunkenness that becomes sin, not the drinking of the beer. We began this series by asking what is and what ain’t relative to what law is still required to be obeyed and what law is not required to be obeyed. When looking at all the Scripture that bears on this issue, it becomes apparent that laws prefiguring the Christ event and what that event means for our standing before God are the laws that are no longer required to be obeyed. Such law would include the entire body of ceremonial law revealed in the Pentateuch (the first five books of the OT). It would include the various worship laws such as Sabbath observance, keeping of holy days and new moon celebrations. Paul shows these were all shadows of what has now been filled in Christ. The Christ event fulfilled and brought to an end all law that in someway prefigured and foreshadowed what Jesus did to establish for us a holy standing before God. This is the Old Covenant law that has been abrogated. Old Covenant law that has not been abrogated is all law that produces the kind of relational behavior between humans that God intended from the beginning. Many of the Old Covenant human relational behavioral laws are seen to be in force under the New Covenant. This is evident in the teachings of Jesus, Paul, Peter, James and John and what is seen throughout the NT. While obedience to these laws is not what makes us holy before God, obedience to these laws reflects our love for God and our recognition of His sovereignty. There are two great laws revealed in the Scriptures which are as valid today as they have been from the beginning of creation. Matthew 2:35-37: "`Love the Lord your God with all your heart and with all your soul and with all your mind.' This is the first and greatest commandment. And the second is like it: `Love your neighbor as yourself.' All the Law and the Prophets hang on these two commandments." Jesus is here referring to two commands found in the Old Covenant. In Deuteronomy 6:5 we find God commanding Israel to observe the first of these two commands. In Leviticus 19:18 we see the second of these two commands cited. Loving your neighbor as yourself is defined in Scripture by a myriad of behavioral laws established by God. We see these behavioral laws extant under both the Old and New Covenant. Many of these laws are seen as extant from the beginning of creation. Scripture shows to love God means to live by his commandments. It is to acknowledge His sovereignty which includes not worshiping anyone but Himself as the Most High God. We have seen that under the Old Covenant there existed a great deal of law that served to distinguish Israel as a nation from all other nations of the world. A certain amount of this law also appears to have served as a prefiguring or foreshadowing the Christ event and all that event portends for humanity. These prefiguring or foreshadowing laws appear to include all ceremonial and sacrificial law and various worship laws that, because of their fulfillment in Christ, became obsolete with the establishment of the New Covenant. Loving God no longer includes obedience to these laws. Loving God under the New Covenant involves recognition of the Christ event as God’s facilitation of our righteous standing before Him and loving our neighbor as ourselves. This is the foundation of our Christian walk. Under the Old Covenant, a relationship and a right standing before God was predicated on fulfilling the requirements of ceremonial, sacrificial, worship and moral law. Under the New Covenant, fulfilling the requirements of ceremonial, sacrificial, worship and moral law is not what establishes a righteous standing before God. A righteous standing before God is established through the Christ event. The sacrificial, ceremonial and worship law that is seen in Scripture as prefiguring and foreshadowing the death of Jesus stands fulfilled and is not in need of further fulfillment. This law is no longer extant. This law has been abrogated by the New Covenant. This is the law that ain’t. Under the New Covenant, we are to continue loving the Lord God with all our heart, soul and mind. This involves acknowledging the God of Israel as the one and only sovereign God over all reality. Acknowledging the sovereignty of this God is to worship only Him as the Most High God as ordered in the first three of the Ten Commandments. Our worship of God also includes being obedient to the moral law He established at creation and which was included in and expanded upon under both the Old and the New Covenant. The Christ event didn't abrogate moral law. It magnified it and made obedience to it more attainable by providing help to keep it through the power of the Holy Spirit. This is the law that is. Additional essays on this website that pertain to Old Covenant versus New Covenant Law can be found at: "The laws of clean and unclean," "Which day is the Christian Sabbath," What is Holiness?" "Hebrews: A Study in Covenantal Transition."